Before the onset of the 2004 hurricane season, IEM, with a team of three subcontractors, was awarded a FEMA contract to support catastrophic planning for Southeast Louisiana. The goal of the project was to develop a functional, scenario-based exercise that would drive the writing of Incident Action Plans for catastrophic hurricane response and build the foundation for Functional Plans. Ultimately, these plans would serve as a “bridging document” between local and state plans and the National Response Plan (NRP). Hurricane Pam “planning exercise” resulted in usable plans. The Southeast Louisiana Hurricane Planning Project (known as “Hurricane Pam”) was an innovative concept that combined two facets of emergency management: planning and exercises. The full process of planning, training, and exercising can take several years to complete. “Hurricane Pam” was a “planning exercise” designed to create usable action plans in a short timeframe via scenario-driven decision making. The initial eight-day exercise in July 2004 involved more than 300 participants from 13 parishes; more than 15 federal departments and agencies; more than 20 state agencies; FEMA Headquarters; FEMA Regions I, II, IV, V, and VI; the Louisiana Office of Homeland Security and Emergency Preparedness (now the Governor’s Office of Homeland Security and Emergency Preparedness, or GOHSEP); the States of Mississippi and Arkansas; and numerous volunteer agencies. Planning, operational personnel sitting together to plan. Participants (both planners and responders) were provided with a catastrophic hurricane scenario, a set of consequences that would result from that scenario, and assumptions designed to stress the emergency management system and force thinking on critical planning topics. Groups were established to focus on developing action plans for six primary areas determined by FEMA and the State of Louisiana prior to the workshop: Search and Rescue, Temporary Medical Care, Sheltering, Temporary Housing, Schools, and Debris. As the exercise unfolded and additional topics of concern came to light, IEM established new groups to focus on building action plans for those areas. Functional action plans developed from Hurricane Pam exercise. “Hurricane Pam” Phase 1A was held November 29-December 3, 2004, in New Orleans. Attended by approximately 100 officials, this workshop focused on Temporary Housing, Temporary Medical Care, and Sheltering. “Hurricane Pam” Phase 1B was conducted July 25-29, 2005, in New Orleans, and was attended by 100 officials. This workshop focused again on Temporary Housing and addressed a new topic: Transportation, Staging, and Distribution of Critical Resources. On August 23-24, 2005, the Temporary Medical Care Supplementary Planning Workshop was held in Carville, Louisiana. It was attended by approximately 80 officials. This was the third workshop addressing medical issues. Living document to be continually improved. 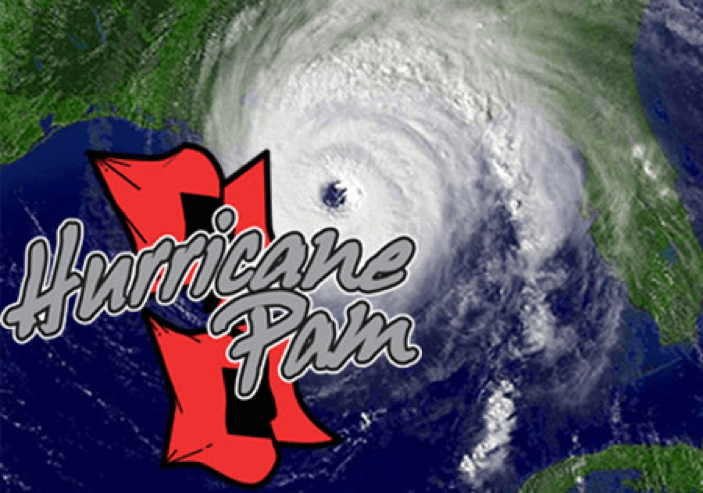 The consolidated document developed from the “Hurricane Pam” workshops was intended to be a living document, continually improved through workshops and exercises. The success of the exercise-driven planning process developed by IEM indicates that it will serve as a valuable tool for future catastrophic planning projects, and the action plans developed through “Hurricane Pam” lay the foundation for more detailed catastrophic planning in the future. U.S. Senate’s 2006 report on Hurricane Katrina—“Hurricane Katrina: A Nation Still Unprepared”. Blog post by Madhu Beriwal: BP Oil Spill, Hurricane Katrina, 9/11—Will We Learn From History?